1 of 5 In a large glass bowl, combine sugar with potato starch. Whisk in egg whites until well incorporated and slightly foamy. Mix in coconut, 3 tbsp water, the almond flour and salt until combined. 2 of 5 Microwave mixture for 30 seconds. Mix well with a silicone spatula, making sure to scrape sides of bowl. Repeat 3 times. Stir in orange zest and vanilla. Refrigerate 30 minutes. 3 of 5 Heat oven to 325 degrees . Stir mixture. Spoon 30 rounded teaspoonfuls of mixture onto 2 parchment-lined baking sheets. Press 2 to 3 chocolate chips inside center of each cookie. Gently spoon 1 level tsp coconut mixture on top of each cookie. With moistened hands, bring up bottom layer to top layer and enclose chocolate. Round each mound to resemble a ball. 4 of 5 Bake 25 to 30 minutes, until golden brown. Remove from oven and cool 10 minutes, then transfer to a wire rack to cool completely. 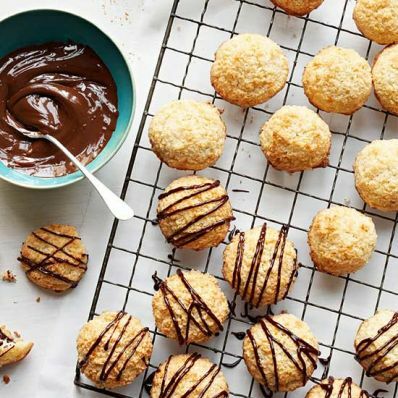 5 of 5 With a spoon, dribble a stream of Chocolate Drizzle over macaroons. 1 of 1 Combine 1/4 cup semisweet chocolate chips and 1/2 tsp coconut oil or light olive oil in a small glass bowl. Microwave for 30 seconds. Stir. Microwave for an additional 30 seconds, then stir until chocolate is completely melted.